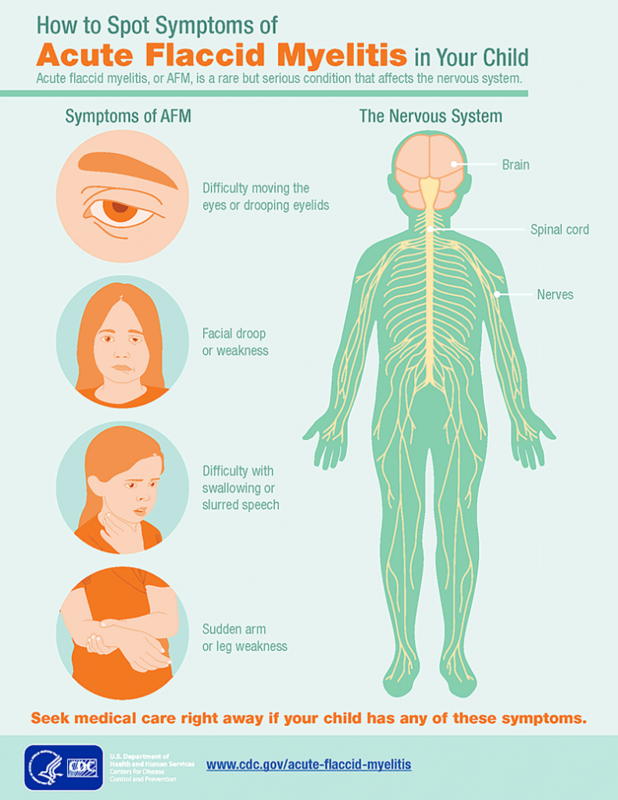 Acute flaccid myelitis (AFM) is a rare but serious condition, which is typically seen in children. It affects the nervous system, specifically the area of the spinal cord called gray matter, which causes the muscles and reflexes in the body to become weak. CDC said they have been thoroughly investigating the AFM cases that have occurred since 2014 when they first noted a large number of cases being reported. So far in 2018, there are 90 confirmed cases of AFM in more than 20 states. These 90 confirmed cases are among the total of 252 reports that CDC received of patients under investigation (PUIs). In 2017, CDC received information for 33 confirmed cases of AFM in 16 states. Tuesday, the CDC said that almost all patients with acute flaccid myelitis this year first showed signs of viral infections. Further, CDC has tested body fluid specimens from 71 patients this year and 54 percent of these showed positive tests for non-polio enterovirus A71, EV-D68, and several other viruses. The states reporting cases so far are Arizona, Colorado, Georgia, Indiana, Iowa, Massachusetts, Minnesota, New Jersey, North Carolina, Ohio, Pennsylvania, Rhode Island, South Carolina, Texas, Wisconsin, Alabama, Arkansas, California, Florida, Illinois, Kentucky, Louisiana, Maryland, Massachusetts, Michigan, Montana, Nebraska, Nevada, New York, North Carolina, Oklahoma, and Washington. In October, Wolfson Children’s Hospital in Jacksonville, Florida confirmed that a 3-year-old girl was diagnosed with AFM. The CDC says it is working hard to find the causes and origination of these AFM cases.